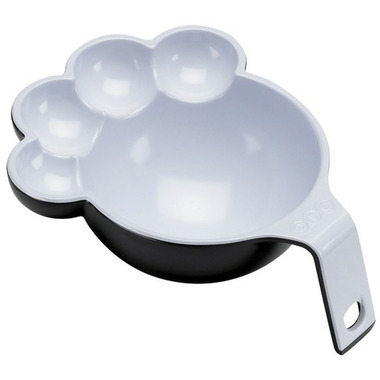 Serve your pet up in style with the Ore' Pet Pet Food Scoop Large Paw Black & White. Playfully paw shaped and featuring an ergonomic handle with a hole for hanging, this scoop holds 1.00 cup of dry pet food, perfect for medium to larger sized dogs. Size (inches): 5.00 dia. x 2.00 h.